Before there was a casino, Genting Highlands was an innocent little heaven for the young and old. Up on a cold-weathered mountain where there’s an outdoor theme park and hotels to check into. Highly doubt anyone in Malaysia would say that they haven’t been there. It’s now the year 2012. So what’s new and what’s not? Usually it’s all the waiting that eats up the time of day of the visitors but on this day out with Nuffnang and bloggers, we had an opportunity to check out some of the rides, both outdoor and First World Indoor theme parks, without needing to queue up at all. At the outdoor theme park, we kicked things off with Bumper Boat. Basically like bumper cars but a little more difficult to maneuver and way slower acceleration, hence way less impact when you crash someone. My shoes got a little wet due to the little splash of water from all the bumping. The engine of the boat I took died halfway and ironically, I had to ask for someone to bump me, and bump me all the way back. If the queue is long, I suggest you move along to something more worthy to wait for. experienced it many times before. 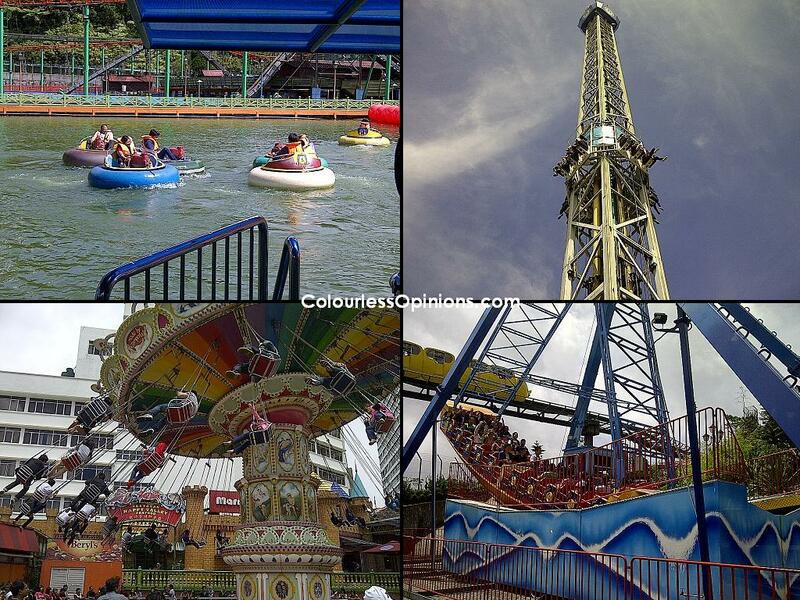 Therefore, it remains as one of the most thrilling theme park rides in Genting. km/hour to bounce off the starting position a few times until it stops. allowing me to breathe only when the ship is going swinging back. Certainly not good if I had heart problems. The Spinner seems kiddish but it’s actually quite a fun ride. It makes me feel like I’m sitting on a flying chair that goes round and round till I’m dizzy. To make it a little more terrifying for myself, I imagined the possibilities of the cables disconnecting from my seat. That day was the first time I’ve ever got to for the go kart a.k.a Grand Prix Fun Kart. The queue there has always been one of the longest and every batch takes forever to finish (5 minutes per batch). Furthermore, the speed of the go-kart cars seem very slow (10 km/hour), making it virtually unworthy to queue for. However, it’s actually more fun than it looks. Yes, we might be able to sprint faster than the cars in reality but the feeling of being is a vehicle race is a whole different thing. Taking over the others while cornering skillfully, imagining myself as a F-1 driver. It’s just pure fun. If they decided to revamp the circuit and probably bring the speed of the cars up a notch or two in a safe way, it could become one of Genting‘s main attraction once again. 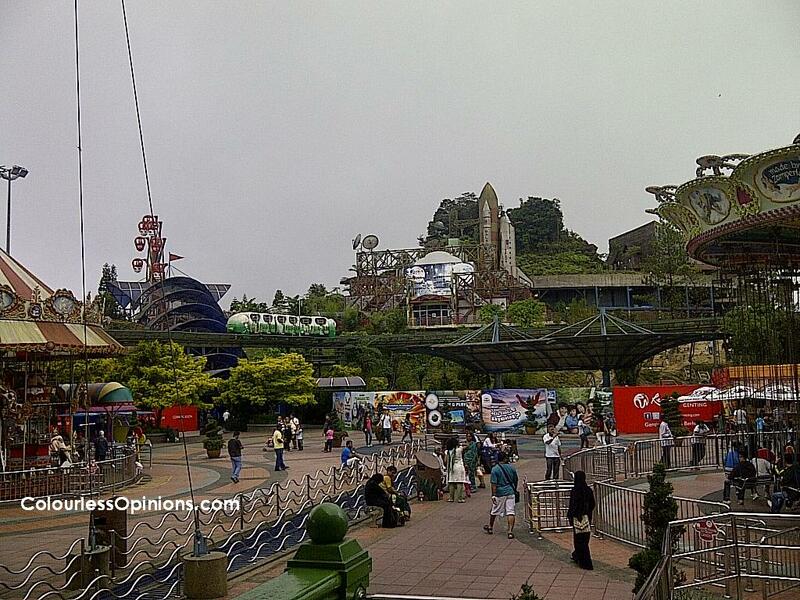 The Flying Coaster, one of Genting‘s recently added attractions, was our final outdoor theme park ride of the day. I had never went for it before this because there’s an additional payment for it even if you paid for the theme park ticket (with ticket wristband – RM10, without – RM12). It’s the most thrilling ride for me, personally, ’cause it’s my first time with it. Although the passengers have to position themselves to lay flat out with chest to toes facing down and hands straight out like Superman the entire minute of the roller coaster ride, it feels safer than the Corkscrew. However, the cushion padding of ride absorbs the sweat and scent of passengers, making it quite a smelly first time experience for me. Speaking of Corkscrew, it was closed on the day. How could the main roller coaster be closed when the theme park is opened for business? There were actually one or two more other exciting rides that weren’t available or were under maintenance when I was there. Was it because it’s a weekday? Bet it was disappointing for those who came all the way there and paid for the fee. Bet it was even more frustrating for those who were over weight or under height for the rides. If you haven’t been there and planning to, please ensure that you’re below 100 kg and above 122 cm to avoid disappointment. For ticket prices, please refer to here. So nothing much has changed at the outdoor theme park. No exceptionally new rides and most of the staffs were still quite unfriendly. The queues were unusually long for a schooling weekday, can’t imagine how it is now on weekends. There were also no music playing. Actually I can’t recall if there ever was but it definitely would’ve made the atmosphere more lively. 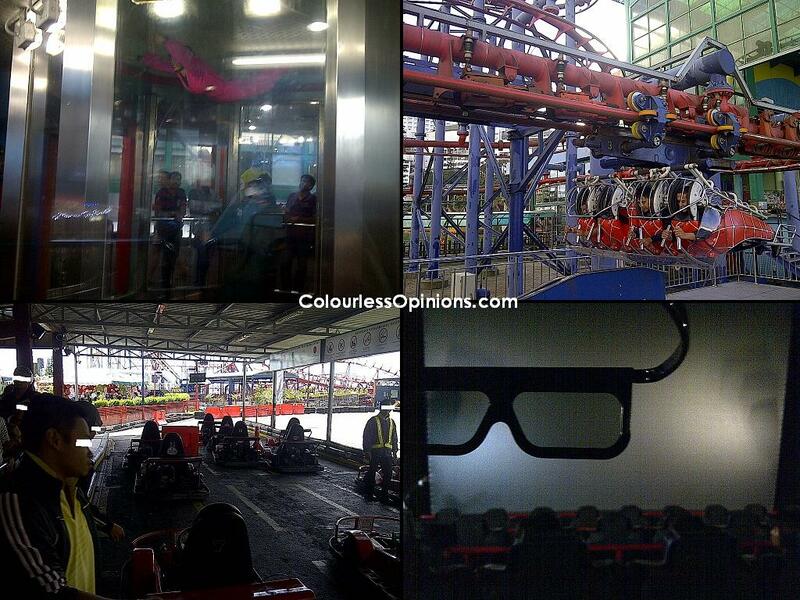 We moved on the First World Indoor Theme Park for Sky Ventures and the 4D Motion Master. The Sky Venture is basically a skydiving simulation where there’s wind tunnel that’s strong enough to blow people below 114 kg off the ground. I’ve never gave it shot because I thought it was expensive (with theme park ticket wristband – RM38, without – RM50) for just 2 minutes of floating around in a glass box. But it’s actually quite challenging. I couldn’t really get off the ground at first even when I thought I know I could apply the techniques they taught. Even when I could, I kept bouncing off the walls. When I reached higher than the glass window, I got panicked, lost my composure and fell lower. The instructors were there to help out and to take each and everyone for a flying spin. The wind was strong, it blew one of my contact lenses out of my eye. Thankfully it was dry and damp enough to get stuck on the goggles. Should’ve worn the goggles properly. Customers’ experience will be recorded and can be burnt to DVD at the price of RM18 if interested. It would be more fun if the tunnel was bigger and more customers can go in it together at the same time instead of taking turns one by one. The 4D Motion Master Haunted Mine ride was the final thrill we had for the day. It’s basically a scenario-based virtual roller coaster. Only RM8 per entry, decent fun for all ages, nothing terrifying. There’s only one ghost on the whole show and it’s just the annoying host of the ride. The problems I had with it were the soft sound (I couldn’t hear what the ghost’s babbling about) and the lack of sensitivity of the moving seats that didn’t completely follow the movement of the screen. The Haunted Mine is only available in the evening to night while the other one, The Little Prince, is only available in the morning to afternoon. I hope they’ll have something more extreme in the future that could appeal more to adults like myself. We had lunch at Happy Valley Seafood. Average stuffs, really, and it took very long for them to serve us. Then for dinner, we had a buffet at Coffee Terrace where there’s a broad variety of cuisine from local to Japanese to Western and more. The foods were pretty good and the pricing per person is not too bad (below RM70). 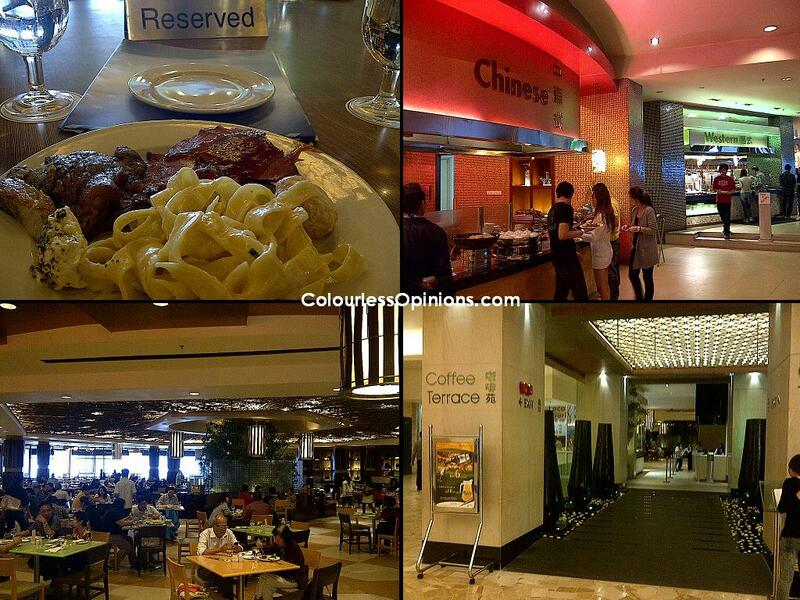 I think it’s probably the best place to dine at in Genting. Some of the staffs were a little moody though. 1. Like Heineken’s Facebook Page to view the contest application. 2. Click on “Time to Get Legendary” on the application interface to join the contest. 3. Click of the next red sign and answer the one question given. To know the answer, just watch the video! If you were a football fan since the past few years, you should be ashamed if you don’t know the answer. 4. Next, just fill in the profile form (ensure that the details are correct so that they can contact you if you win) and invite three friends that are certain to join you. That’s it, you’re done! UPDATE: This contest has already passed. Go to this entry to read about the event. it's been forever since I've been there~! gosh so much have changed! it look and feel good..
i miss the solaro shot,1st time went to Genting..
Really curious how it feel..
not visited the theme parks for soooooo long. always been there just for yumcha only.